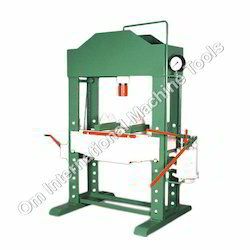 We are manufacturer of Hydraulic Press Hand Powered. The sturdy construction of all presses grantees stability and durability. The Press is provided within a 2 stage hand pump. The low pressure pump is used for rapid advance of piston at low pressure. The high pressure Pump is provided with a special material lining and is used for slow advance at high pressure. Tons: 5, 10, 25, 40, 50, 60, Etc. Travel Of Ram: 100, 125, 150, 180, MM Etc. Between Ram To Bed: 75x600, 75x600, 75x600, (MIN . & MAX.) Etc. Motor H P: 3, 5, 7.5, Etc. Between Column Width And Length: 500x125, 600x150, 650x150, 800x300, Etc. We are involved in providing a wide range of Manual Hydraulic Press, which is made by talented professionals who employ the industry-accepted material and advanced techniques. - heating platens size-7x8x1comprises of aluminum with mica type heaters. manually operated hydraulic press of 250 kn capacity. 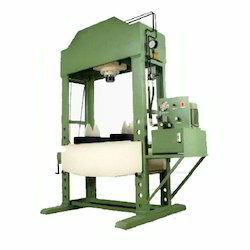 So as to accomplish high level of customer trust, we are keenly involved in offering Manual Hydraulic Press. We offer them at reasonable rates.